Storage Solutions | Bunk Beds | Shelving. Bunk Beds | Shelving | Built-in Units. 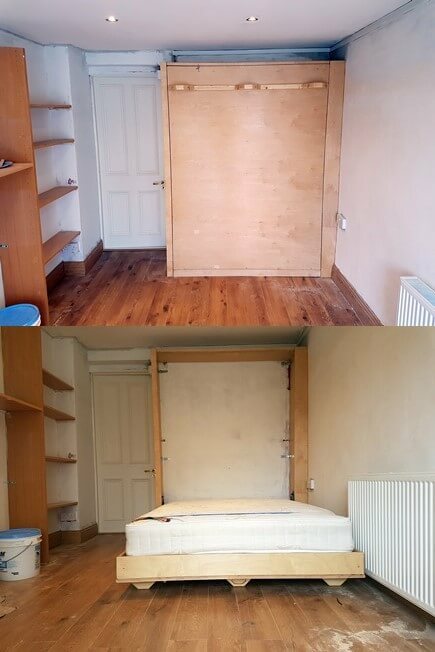 Access doors, fitted beds, shelving. The purlin has been moved back three feet, and replaced with a support frame designed to carry the access doors to the loft. This left a step where the floor was previously lowered. A double bed was made to utilize this space with two push opn drawers beneath. Trunk style storage was made at one end of the bed, with a shelf above. A lean to roof is a great solution to increase storage about the home. This roof over side passage is eight meters long by one meter wide, closed in with doors on both ends. 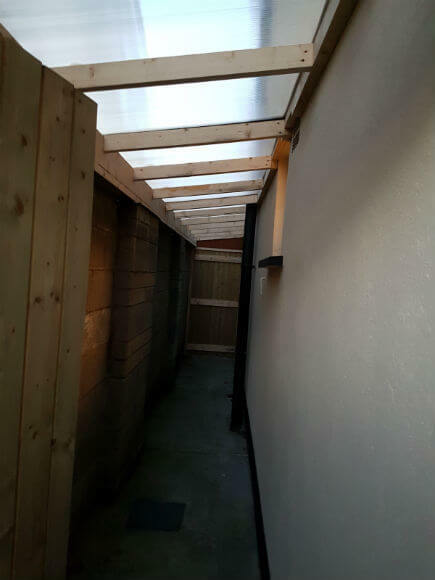 The roof has been built six inches short of the boundary line to allow for new pvc guttering. The party wall could be completely shelved, creating an abundance of storage space. Built in floating shelves with a base unit to match. Ideal for books and ornaments, with space in the base unit for storing bottles. These two units built in alcove space in an office. 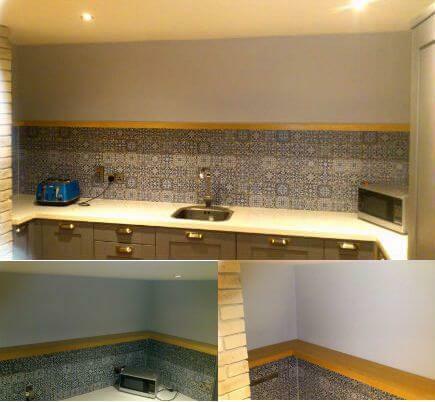 No handles have been used because a flush to wall finish was required, making the appearance of wooden panels on the wall. Thus squaring the room and creating a feature. Files can be neatly stored away(some for seven years). This is one storage solution, that gets the thumbs up! 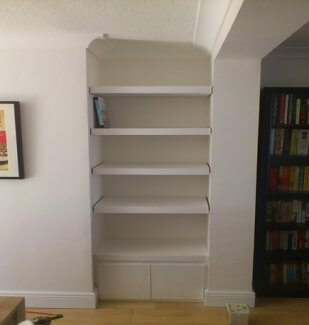 The two alcove spaces were different widths, this is not a problem. By building the centre section of wall out, one unit can then be built to finish wider. Then all the panels can be made equal, creating a wall feature in the room. Built in bunk bed, No posts. This style of bunk bed, also known as a loft bed, can be fixed just about anywhere. 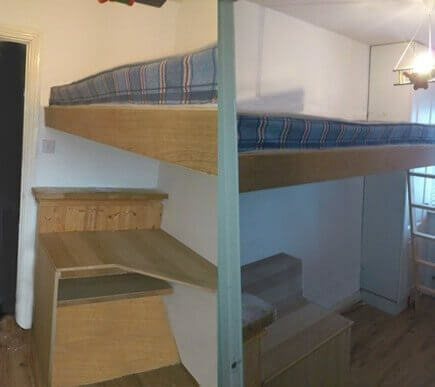 The bunk bed in the photo, has been fixed to the studded walls on two sides(block, or dry lined walls are not a problem), and the outside corner has been fixed, without the use of a bed post. This opens up the space in the room below. Now the desk can be fitted. The shape of the desk, with a 45 degree angle, helps provide foot space, where the rise of the stairs encroaches the box-room. A shelf is also added beneath the desk, to make use of all available space. The head height beneath the bunk bed is approx.4feet 10inches. Plenty of space for homework, office, gaming, play area etc. A standard single sized mattress sits on the solid wood frame, The Oak finish provides an elegant natural look. The steps are made to size, and with the use of brackets can be moved and placed, where best suits(changing the sheets on the bunk bed is a lot easier this way). 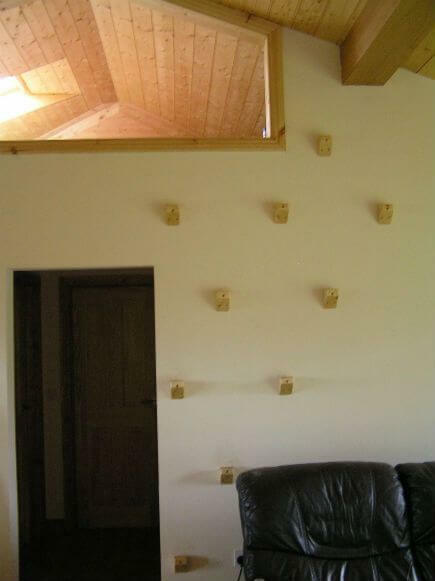 A Climb wall To Loft. The climb wall is a great space saver, obviously not practical in many situations. In this house it worked great , with it being a novelty the kids loved it. 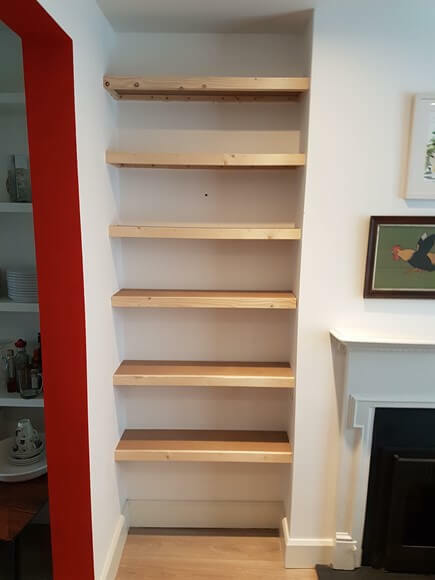 Very strong solid pine shelving, 3 meters long and 300mm wide. Designed to carry the weight of large books. Inexpensive floating shelves. Made with solid pine and mdf. Solid Oak Wrap Around Floating Shelf. Solid oak wrap around floating shelves, dimensions: 250mm x 45mm American white oak. 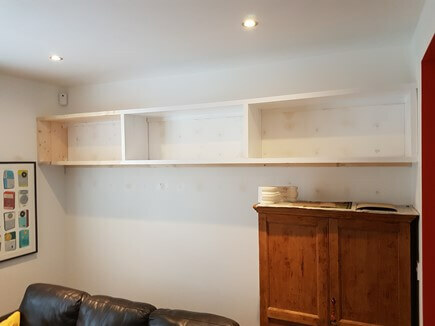 These three shelves are fixed using hidden fixing into solid masonry walls. With hinged top, doubles as seat. This T.V. Accessory Storage Solution also doubles as a seat when closed. 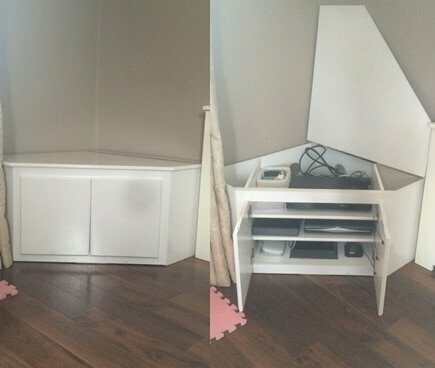 Simply email your measurements and requirements, for a corner unit like this, or one of your own design. These storage units were made to measure, and then delivered. After arrival they were assembled. 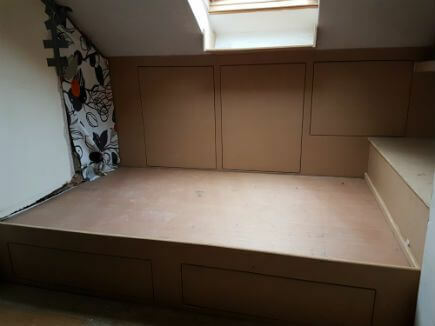 The space in this 'room' is very tight, 12'x5'. A walk in wardrobe come storage room. No doors have been used, due to the limited space. The amount of storage created, solved an immediate household(apartment) inconvenience. The home in question was able to pack away everything, and then some. We need more storage solutions like this, in the world we live in today. Fitted works best! 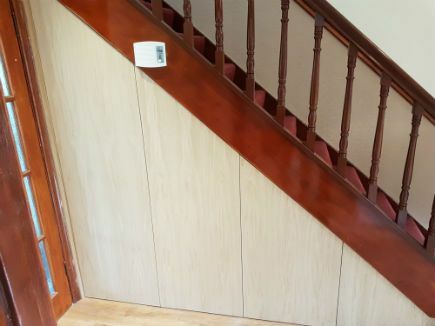 Three push open oak veneer doors, with one fixed panel, make up this minimalistic under stair storage area. The floor has been built up 12mm to the same level as the new varnished oak laminate floor. Which was also installed at the same time. 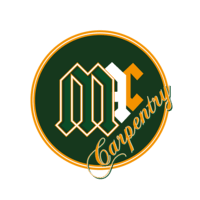 COPYRIGHT ©MAC CARPENTRY, 2019 - HOME RENOVATIONS IN DUBLIN. ALL RIGHTS RESERVED.